A nine month old puppy does get bored and when your backpack is on the floor the waist belt buckle can appear like a puppy chew toy. Dang, I didn’t expect to come home to this. So instead of backpacking last weekend we went on day hikes to the Mt. Baker Wilderness Artist’s Point area which is only 60 miles from home. Saturday we hiked the Chain Lakes Loop with mostly overcast and some fog, but actually good hiking conditions. Sunday was the perfect clear sunny day so we went back to see what we missed and climbed Table Mountain for the ultimate experience. I found out on the way down that dogs were not allowed and I understand why, but Brook sure did enjoy breaking the law. The original plan was to backpack through the Chain Lakes area to Ptarmigan Ridge but it was more snowed in then I would have expected, so I’m definitely looking forward to doing Ptarmigan Ridge in the future. The Chain Lakes loop was a nice 7 mile hike. Iceberg Lake was full of ice cubes, plenty of snow for the pup to play on and enough visibility to make for the motivation to come back the next day. Back the next day to beautiful clear sunny mountains and OMG it was gorgeous. Luckily I arrived at the Artist’s Point parking lot before the masses totally engulfed the lot. I headed up Table Mountain (the fortress looking rock in photo above) without doing any research which would have told me that dogs were not allowed. And that is probably a good rule seeing how the switchback path up the side of the mountain was only a couple of feet wide in many places. As we climbed to the top the views just seemed to explode for us. Once you climb the table leg the rest of the mountain opens to an expansive table top mostly snow covered. Would have loved to have taken a seat for a relaxing break but the black-flies were waking up. 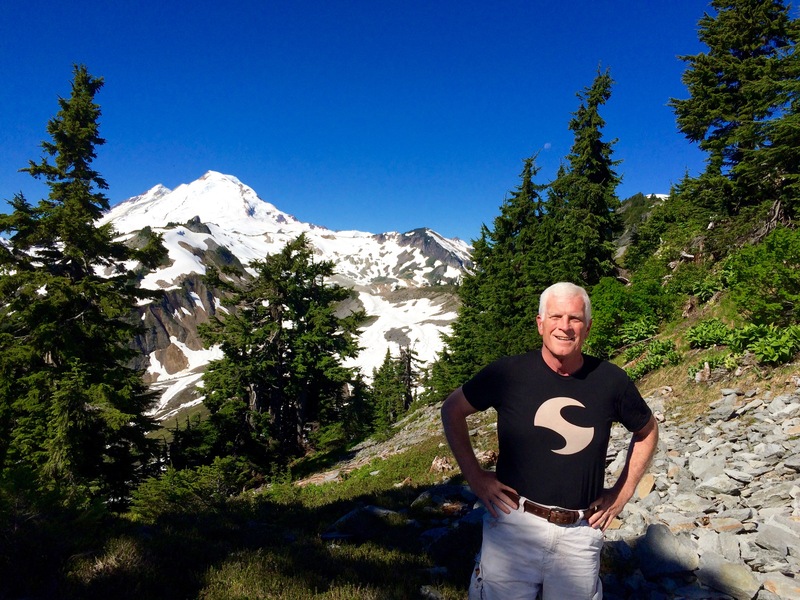 Brook and I hiked all over it taking in the 360 views of the Mt Baker Wilderness. Here are some of those views. OK, now I need to deal with getting my backpack repaired, will probably use Rainy Pass out of Seattle. Next week I take on the Olympic Coast with friends from Shi Shi to Rialto Beach with my old backpack or maybe a new smaller sized pack. 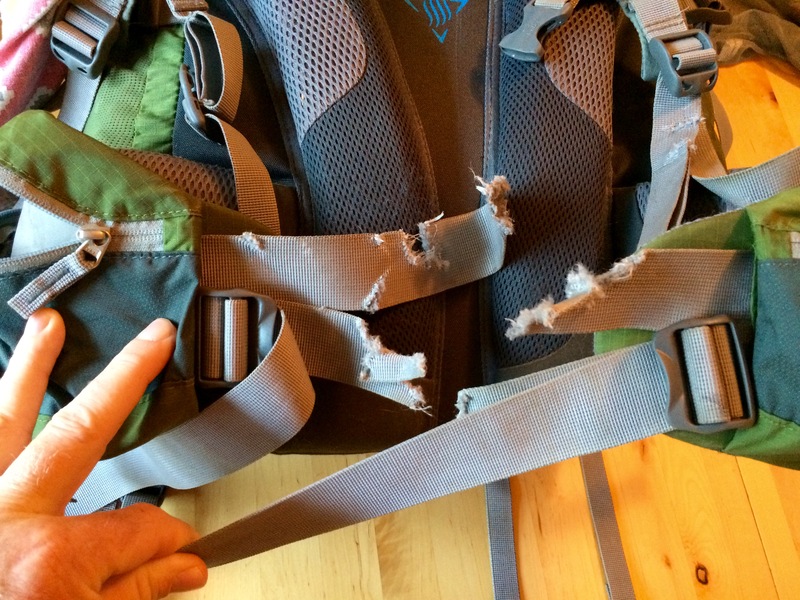 FYI – I got the backpack repaired at Rainy Pass for $24. But I did go ahead and buy a new ACT Lite 50+10 Deuter Pack that I used on the Olympic Coast trip but wanted for a smaller weekend pack. 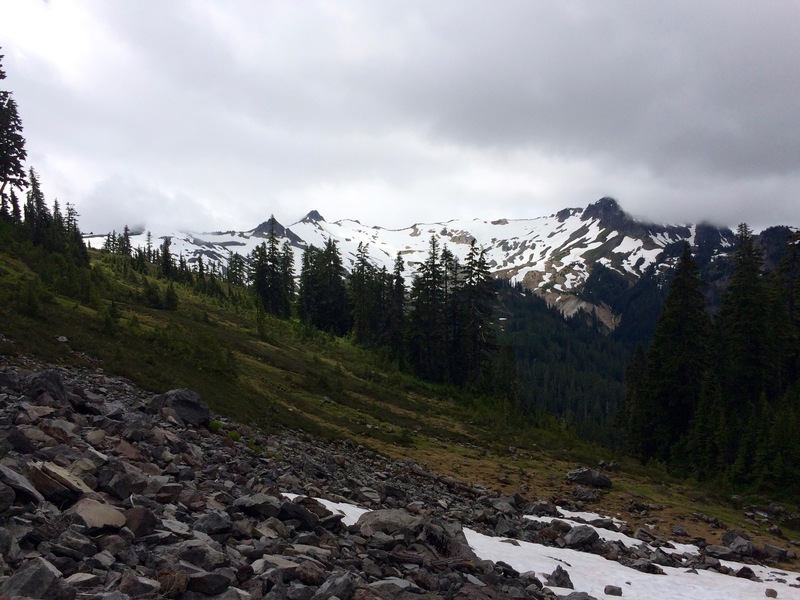 Posted on July 26, 2016, in Backpacking, Hiking, Mt. Baker, Wilderness and tagged Artist's Point, backpacking, Bad Dog, Chain Lakes, Mt. Baker, Mt. Shuksan. Bookmark the permalink. 2 Comments.